I couldn't think of a suitable name for my latest batch of soap but thought I had better write down the ingredients I used before I lost the piece of paper I had it written on. Not a good habit to get into when soapmaking as it really is better to keep a notebook or to write a post about it straight away but birthday celebrations got in the way and I didn't get round to it. 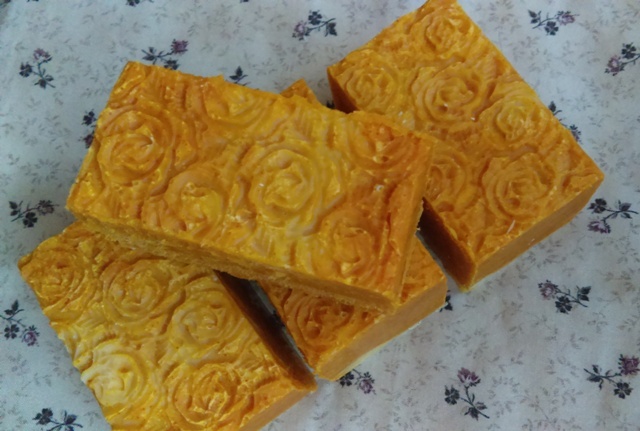 I noticed that Nil from The Little House by the Lake has just made her first batch of soap using Rhonda's recipe and method so if you have always wanted to make soap and haven't been brave enough take a look at the soap she has produced. Well done to Nil! 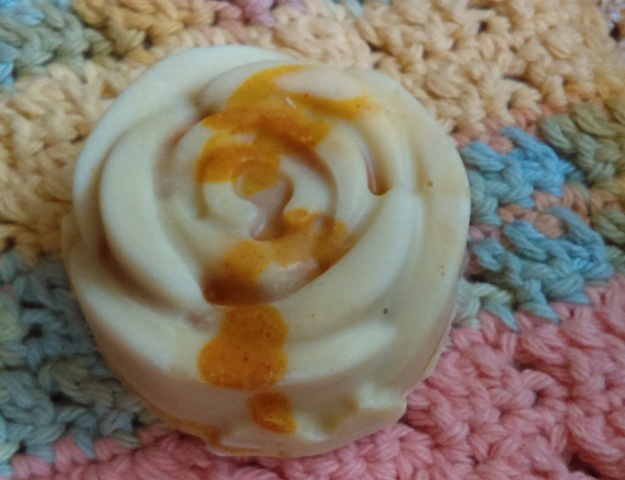 I really have been a tad scatter brained where my soapmaking is concerned lately and was having trouble finding a suitable recipe online with included cocoa butter and macadamia nut oil both of which I had bought a while back and wanted to use them to see how the soap turned out. Finally I found one but now I can't remember where that was to give credit to the blog owner so my apologies if she happens to read this. I looked up so many blogs that it all became a blur after a while. Anyway, finally once I found what looked like a good one I decided that the next day I would make it. Well, I totally forgot how hard coconut oil can get on a really cold day and do you think I could get it out of the bottle. I had already added the lye to the water and there I was digging around in the coconut oil bottle with a knife trying to get some out and it took forever. I couldn't be bothered weighing the exact amount when it came to the cocoa butter as it was in big hard lumps so just hoped it would work out. The lye was cooling too quickly and I needed to get started. At least I had chosen the colour and got the Annatto Red (used in cheese making) out of the fridge in preparation but had forgotten to choose and weigh the fragrance oil. As it turned out there wasn't enough of any one fragrance oil I had on hand to use in this recipe so it ended up being a combination of three. Thankfully it doesn't smell too badly as that was a bit of a risk. A word of advice, make sure you have weighed all your ingredients prior to starting the process of making soap. I thought I would do a swirl in the mould again so poured half the plain mixture into a jug and half into another jug that I coloured with the Annato Red. Then I poured both colours into the moulds at the same time and came up with some different variations. It didn't turn out too badly but the soda ash formed on some of the soaps after being taken out of the moulds. 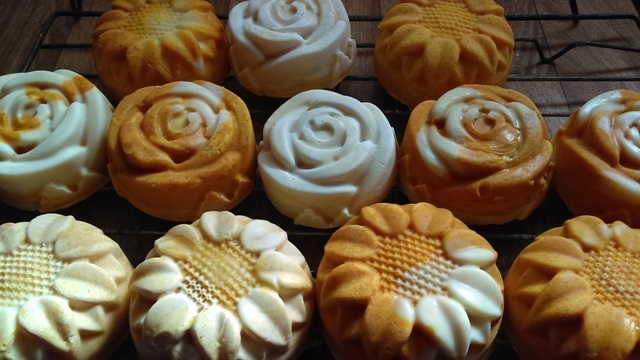 A soapy friend told me she puts her soaps into the freezer for a couple of days in their moulds then they stay in the fridge for a few more days before being taken out and unmoulded and that seems to inhibit the soda ash. Even if I spray with Isopropyl Alcohol I still seem to get some soda ash. If you don't know what it is then read Explaining and Preventing Soda Ash by the Soap Queen. It really isn't all that important as it is just an appearance issue but I imagine if you were selling your soap you would want to prevent it. The soap still washes off the dirt and goes down the drain just the same. LOL! I don't have the room to leave my soap in the top of the fridge freezer and the other freezer is full of the CEO's fish and smells like fish too. Somehow I don't think fishy smelling soap would be very appealing. Next time I make soap I will make sure I have everything ready beforehand. I still have lots of clays to use up so there will be more experimenting in the future to use them up as it takes forever to use up a packet of clay. 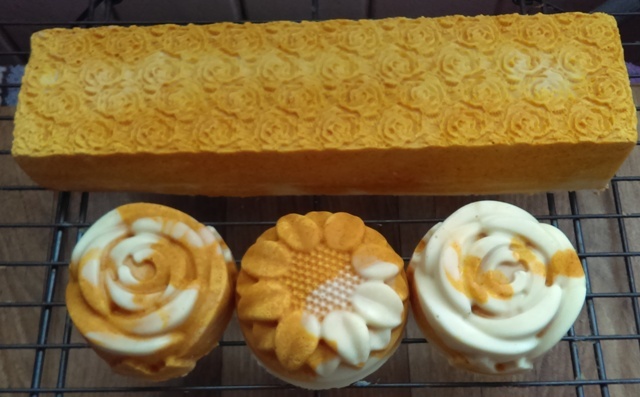 Who is going to be next to make their first batch of soap like Nil? Thank you Chel! 😊 I really I can't wait to use my soap. The rose moulds are just cheap ones from The Reject Shop, Mimi. 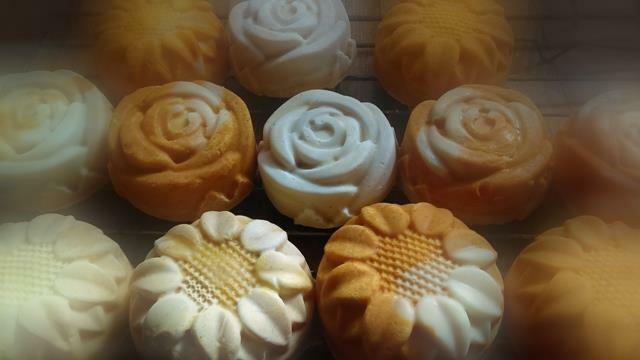 Nice-looking soaps, Chel. I hate that panicky feeling when the ingredients aren't cooperating ;) Last week I made a 2 lb. batch and just added a tad of Patchouli oil to it. Smells pretty good, just a hint of a peanut-y smell. I agree, Mary. 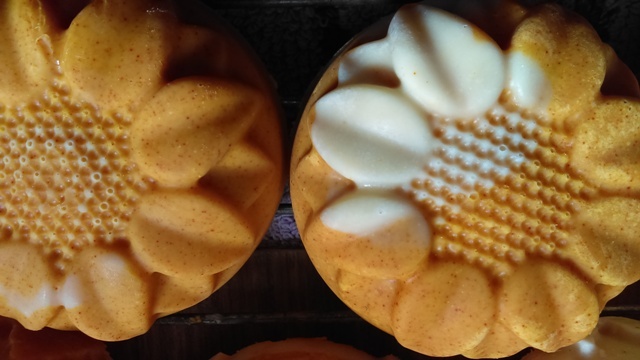 Soap can be a bit unpredictable at times once colours and fragrances are added. Pauline, if I had been more organised I would have put the bottle of coconut oil in hot water or out in the sun. I normally use coconut oil year round but of course it is softer in summer. You should be able to make a successful batch in summer. Just start off with a simple recipe.